Back in the old days, heavy metal was just heavy metal and nothing more. In the mid-Eighties, things changed with the genre becoming more extreme and spawning sub-genres like thrash, death and black metal. Regular metal bands had a hard time getting recognition in a time of so much stylistic innovation. It was only towards the latter half of the Nineties when Hammerfall made the primal sound of metal popular again, and what was a rather pleasant curiosity at first, soon became the new, so-called true metal. Nowadays there are countless aspiring young bands trying to sound authentically old school, with some doing really cool stuff, while others still keep struggling. French metalheads Holy Cross definitely belong to the latter category. Founded in 2006, they instantly released a first demo, and then took three years before their actual debut Under The Flag saw the light of day. The five young men have certainly learned all their lessons. 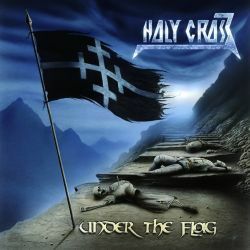 Starting with an archetypical cover, and continuing with Norse influenced song titles that belie their French origins, Holy Cross try really hard to come across as a thoroughbred true metal band. But let’s face it: they try to hard. The ten songs on their debut all sound good on the surface, but you better not try to dig any deeper. The songwriting is too uninspired, the production, although not necessarily bad, doesn’t manage to give the music the power, depth and drama that make this genre so enticing. Strangely enough, the last two tracks are among the highlights and could already be found on their very early demo. This means that either Holy Cross were better songwriters in their early days, or that they need enough time to make their material work. In any case they still have a long way to go if they want to play with the big boys. Until then they will be a promising newcomer that will have a really hard time convincing true metal fans to spend their money on their album when there are so many more worthwhile efforts waiting to be discovered too.